Make healthy, delicious meals in a fraction of the time with this T-fal Clipso pressure cooker. 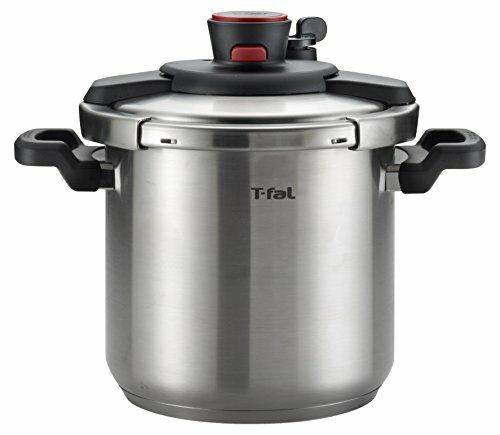 Compared to standard cooking methods, the pressure cooker reduces cook times by up to 70% for fast results—without the loss of valuable nutrients and flavor. The cooker's roomy 6.3-quart capacity makes it easy to create large batches, whether preparing make-ahead meals for the week or cooking for a crowd during the holidays. The pressure cooker’s durable stainless-steel construction ensures optimal cooking and long-lasting performance, and its encapsulated base distributes heat evenly and can be used safely on any cooktop, including induction. Safety features include an innovative one-hand system for simple risk-free opening and closing, the inability to open when in use and under pressure, a variable steam-release valve for added control, and side handles for a secure grip. The Clipso stainless-steel pressure cooker can go safely in the dishwasher (with gasket and pressure valve removed), and a steam basket and stand are included for multi-level cooking, along with a recipe book with cooking tips and tasty ideas for getting started.